This vegan hoppin’ John is made with smoky simmered black-eyed peas, spices and chard. Perfect for New Year’s, or pretty much any day of the year! This is an almost conventional version of a New Year’s classic. It’s cheap and healthy and I didn’t even have to break tradition all that much to make it that way. I first learned of this dish a few years back from a friend who had gotten in the habit of preparing a big pot of the stuff on New Year’s day. I’d never heard of the dish before, but now I know that it’s kind of a New Year’s day tradition in lots of homes in the U.S. Her version was meatless, and I think totally vegan, though I never got around to confirming or trying it. When I decided to make up a batch of my own, I found a bunch of recipes that called for ham or bacon. It seems like that’s a popular ingredient in most versions of the dish. I decided to include only my favorite part of bacon, the smoke, which comes conveniently bottled and in totally vegan form. I also threw in some chard, to flavor and healthy things up a bit, and also to add some variety as a stand in for collards, which I understand are another optional ingredient in more traditional versions. On a side note, the idea behind the dish is frugality — eat cheap on New Year’s, be blessed with abundance for the next twelve months, so I’m thinking the whole optional ingredients thing supports that. 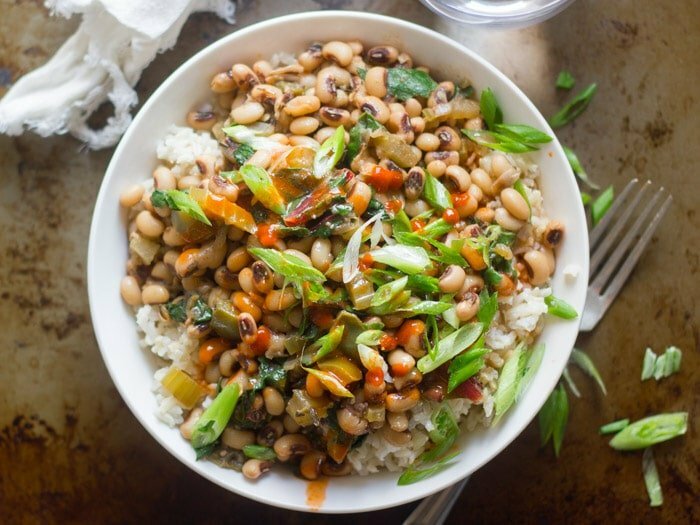 I’ve eaten this hoppin’ John a bunch of times over both rice (traditional) and quinoa (not so traditional). Either way, it’s super delicious and satisfying. This recipe makes a big batch. It’s also super easy to throw together. So it’s perfect in all kinds of ways if you’ve got a New Year’s crowd to feed. 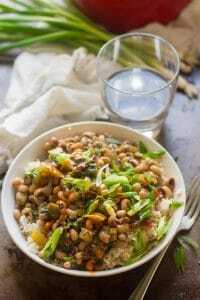 This vegan hoppin' John is made with smoky simmered black-eyed peas, spices and chard. Perfect for New Year's, or pretty much any day of the year! Place the olive oil in large pot and set over medium heat. Add the garlic, celery, onion and bell pepper. Sauté until softened, about 5 minutes. Add the broth, black eyed peas, liquid smoke, bay leaves, thyme, smoked paprika, cayenne and black pepper. Stir a few times and bring to a simmer. Allow to simmer, uncovered, until the peas are tender and the liquid is absorbed, about 50 minutes. Add a bit of water to the pot if it gets too dry. Add the chard and stir a few times. Allow to simmer about 3 more minutes, until the chard leaves are wilted. Remove from heat and season with salt, pepper, and cayenne pepper hot sauce to taste. Remove and discard the bay leaves. Serve over rice or quinoa. Top with scallions and additional hot sauce. Nutrition information does not include rice or quinoa. Love the look of this dish! Eat frugally some days, get the expensive soba noodles the next! This looks super yummy! I have never tried liquid smoke, but always wanted to buy. Can you recommend me any good brand? Thank you! Liquid smoke is pretty Amazing stuff. Wright’s brand is available in most supermarkets and doesn’t contain any weird ingredients. Hope you enjoy it! Looks great. But best to soak black eyed peas for 8 hours first, begore cooking. Thanks Diana! I don’t generally soak black eyed peas, as they’re pretty small and don’t seem to require it, though I hear they might cook up a bit quicker if you do. We just tried this tonight, and it was delicious! I only soaked the black eyed peas for 4 hours before cooking, and they had no trouble softening up. I made this on New Year’s Day and my whole family loved it! Thanks so much for such a fantastic recipe! I only made one change by using spinach instead of collards, but kept the rest of it the same. Thanks again! I would like to try this in the crockpot all day tomorrow! Should I reduce the amount of vegetable broth a little bit? I think so, but I haven’t tried this in the slow cooker so I’m not sure. If you’ll be around to keep an eye on it I’d say start with about 1 cup less, and add more if it gets too dry. Can this be done in the electric pressure cooker? Anyone have the recipe adjustments for that? I don’t have a pressure cooker so I’m not sure! This is great for lunch! Just made it. Great recipe — creative and delicious! I am glad I found this website. I’m glad you found the site too, and so glad you enjoyed this!! Thanks Brendan! We made this today for New Years, but used collards instead of chard (so cooked for longer) and added 2 tablespoons of ACV at the end, because we prefer that vinegary kick to it. It was a perfect traditional flavor and came out great! Thanks! Yay!! Glad you enjoyed it! Happy New Year!! Can I leave out the liquid smoke? Made it last night, delicious! We added seitan bacon and it worked wonderfully to replace the traditional pork or bacon. That sounds delicious! I’m glad you enjoyed it! On the stove now, smelling great! Making it with collards instead of chard. Thanks for the recipe! Tried this and soaked peas for 10 hours and they took well over two hours to soften, which ruined our NY day lunch plans. I’m glad these worked for others but they sometimes need much longer cooking time. I’m sorry it didn’t work out! Usually if beans take that long to cook it’s either because they’re old or being cooked with something acidic (like if you added the hot sauce early). 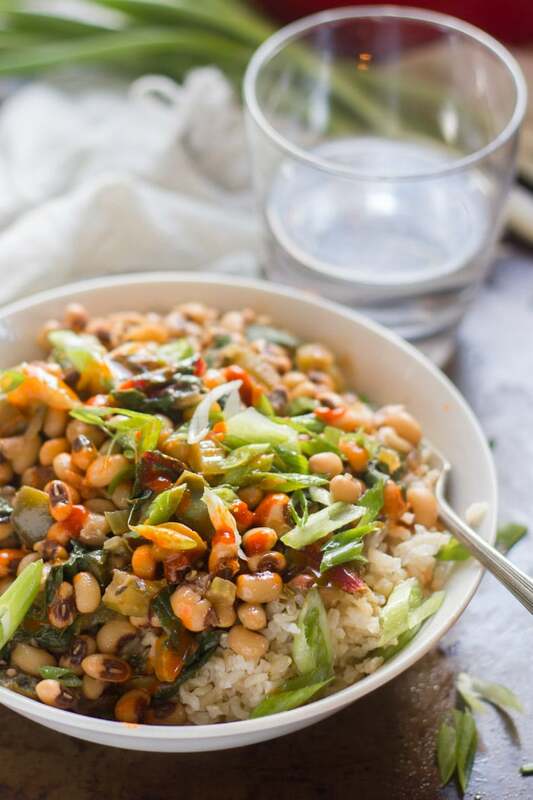 This is the best vegan hoppin john I’ve ever had! The seasoning is perfect! I made it in a slow cooker and added a can of fire roasted tomatoes. We’re not fans of cooked greens so had a kale salad with a maple mustard vinaigrette on the side. 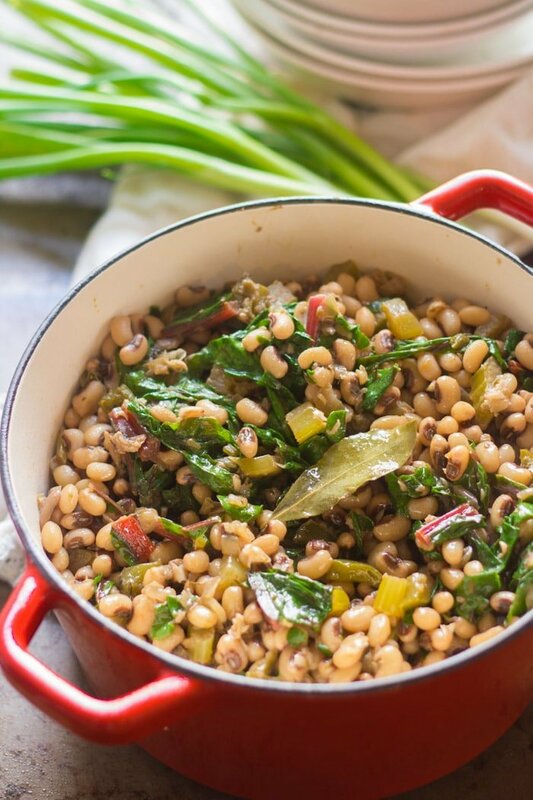 This is the only hoppin john recipe we will use! Yay!! I’m so glad it was a hit! Thanks Karen!